If it's good enough for the Costanzas, it's good enough for Webmaster Central: it's time for a Festivus for the rest of us (webmasterus)! Our special celebration begins not with carols and eggnog, but by remembering some of the popular Webmaster Tools features -- make that Feats of Strength -- for 2007. This year, you gained the ability to chickity-check out your backlinks (<-- that's Festivus-inspired anchor text) and tell Google you want out with URL Removal. And let's not forget Message Center and IDNA support, perfect for those times when [a-zA-Z0-9\-] just doesn't cut it. Feel the power! Festivus Feats of Strength! Last, there are so many Festivus Miracles to share! Such as the many helpful members of the discussion group from all around the world, the new friendships formed between Susan Moskwa, JohnMu, Wysz, Matt D, Bergy, Patrick, Nathanj and so many webmasters, and the fun of chatting with our video watchers, fellow conference attendees, and those in the blogosphere keepin' it real. In 2003, Google introduced a "supplemental index" as a way of showing more documents to users. Most webmasters will probably snicker about that statement, since supplemental docs were famous for refreshing less often and showing up in search results less often. But the supplemental index served an important purpose: it stored unusual documents that we would search in more depth for harder or more esoteric queries. For a long time, the alternative was to simply not show those documents at all, but this was always unsatisfying—ideally, we would search all of the documents all of the time, to give users the experience they expect. This led to a major effort to rethink the entire supplemental index. We improved the crawl frequency and decoupled it from which index a document was stored in, and once these "supplementalization effects" were gone, the "supplemental result" tag itself—which only served to suggest that otherwise good documents were somehow suspect—was eliminated a few months ago. Now we're coming to the next major milestone in the elimination of the artificial difference between indices: rather than searching some part of our index in more depth for obscure queries, we're now searching the whole index for every query. * Originally, I was going to give the stock Google answer, "If I told you, I'd have to kill you." However, I've been informed by management that killing people violates our "Don't be evil" policy, so I'm forced to replace that with sounding mysterious and suggesting that good engineers come and join us. Which I'm dead serious about; if you've got the technical chops and want to work on some of the most complex and advanced large-scale software infrastructure in the world, we want you here. Feeds increase the likelihood that users see duplicate search results. Users clicking on a feed may miss valuable content available only in the HTML page. To address these concerns, we prevent feeds from being returned in Google's search results, with the exception of podcasts (feeds with multimedia enclosures). We continue to allow podcasts, because we noticed a significant number of them are standalone documents (i.e. no HTML page has the same content) or they have more complete item descriptions than the associated HTML page. However, if, as a webmaster, you'd like your podcasts to be excluded from Google's search results (e.g. if you have a vlog, its feed is probably a podcast), you can use Yahoo's spec for noindex feeds. If you use FeedBurner, making your podcast noindex is as simple as checking a box ("Noindex" under the "Publicize" tab). As a user, you may ask yourself whether Google has a way to search for feeds. The answer is yes; both Google Reader and iGoogle allow searching for feeds to subscribe to. We're aware that there are a few non-podcast feeds out there with no associated HTML pages, and thus removing these feeds for now from the search results might be less than ideal. We remain open to other feedback on how to improve the handling of feeds, and especially welcome your comments and questions in the Crawling, Indexing and Ranking subtopic of our Webmaster Help Group. For the German version of this post, go to "Wir entfernen Feeds aus unseren Suchergebnissen." Here's the second of our video blog posts. Matt Cutts, the head of Google's webspam team, provides some useful tips on how to optimize the images you include on your site, and how simply providing useful, accurate information in your ALT attributes can make your photos and pictures more discoverable on the web. Ms Emmy Cutts also makes an appearance. Like videos? Hate them? Have a great idea we should cover? Let us know what you think in our Webmaster Help Group. Update: Some of you have asked about the difference between the "alt" and "title" attributes. According to the W3C recommendations, the "alt" attribute specifies an alternate text for user agents that cannot display images, forms or applets. The "title" attribute is a bit different: it "offers advisory information about the element for which it is set." As the Googlebot does not see the images directly, we generally concentrate on the information provided in the "alt" attribute. Feel free to supplement the "alt" attribute with "title" and other attributes if they provide value to your users! Our goal is to provide users the best search experience by presenting equitable and accurate results. We enjoy working with webmasters, and an added benefit of our working together is that when you make better and more accessible content, the internet, as well as our index, improves. This in turn allows us to deliver more relevant search results to users. February 2003: Google's official quality guidelines have advised "Don't participate in link schemes designed to increase your site's ranking or PageRank" for several years. September 2005: I posted on my blog about text links and PageRank. Many people who work on ranking at search engines think that selling links can lower the quality of links on the web. If you want to buy or sell a link purely for visitors or traffic and not for search engines, a simple method exists to do so (the nofollow attribute). Google’s stance on selling links is pretty clear and we’re pretty accurate at spotting them, both algorithmically and manually. Sites that sell links can lose their trust in search engines. September 2006: In an interview with John Battelle, I noted that "Google does consider it a violation of our quality guidelines to sell links that affect search engines." January 2007: I posted on my blog to remind people that "links in those paid-for posts should be made in a way that doesn’t affect search engines." April 2007: We provided a mechanism for people to report paid links to Google. June 2007: I addressed paid links in my keynote discussion during the Search Marketing Expo (SMX) conference in Seattle. Here's a video excerpt from the keynote discussion. It's less than a minute long, but highlights that Google is willing to use both algorithmic and manual detection of paid links that violate our quality guidelines, and that we are willing to take stronger action on such links in the future. June 2007: A post on the official Google Webmaster Blog noted that "Buying or selling links to manipulate results and deceive search engines violates our guidelines." The post also introduced a new official form in Google's webmaster console so that people could report buying or selling of links. June 2007: Google added more specific guidance to our official webmaster documentation about how to report buying or selling links and what sort of link schemes violate our quality guidelines. August 2007: I described Google's official position on buying and selling links in a panel dedicated to paid links at the Search Engine Strategies (SES) conference in San Jose. September 2007: In a post on my blog recapping the SES San Jose conference, I also made my presentation available to the general public (PowerPoint link). October 2007: Google provided comments for a Forbes article titled "Google Purges the Payola". October 2007: Google officially confirmed to Search Engine Land that we were taking stronger action on this issue, including decreasing the toolbar PageRank of sites selling links that pass PageRank. October 2007: An email that I sent to Search Engine Journal also made it clear that Google was taking stronger action on buying/selling links that pass PageRank. Q: Is buying or selling links that pass PageRank a violation of Google's guidelines? Why? A: Yes, it is, for the reasons we mentioned above. I also recently did a post on my personal blog that walks through an example of why search engines wouldn't want to count such links. On a serious medical subject (brain tumors), we highlighted people being paid to write about a brain tumor treatment when they hadn't been aware of the treatment before, and we saw several cases where people didn't do basic research (or even spellchecking!) before writing paid posts. Q: Is this a Google-only issue? Search engines hate this kind of paid-for popularity. Google's Webmaster guidelines ban buying links just to pump search rankings. Other search engines including Ask, MSN, and Yahoo!, which mimic Google's link-based search rankings, also discourage buying and selling links. The reality is that most paid links are a.) obviously not objective and b.) very often irrelevant. If you are asking about those then the answer is absolutely there is a risk. We will not tolerate bogus links that add little value to the user experience and are effectively trying to game the system. Q: Is that why we've seen some sites that sell links receive lower PageRank in the Google toolbar? A: Yes. If a site is selling links, that can affect our opinion about the value of that site or cause us to lose trust in that site. Q: What recourse does a site owner have if their site was selling links that pass PageRank, and the site's PageRank in the Google toolbar was lowered? A: The site owner can address the violations of the webmaster guidelines and submit a reconsideration request in Google's Webmaster Central console. Before doing a reconsideration request, please make sure that all sold links either do not pass PageRank or are removed. 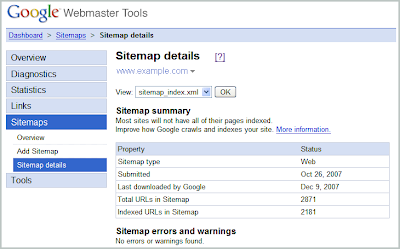 Q: Is Google trying to tell webmasters how to run their own site? A: No. We're giving advice to webmasters who want to do well in Google. As I said in this video from my keynote discussion in June 2007, webmasters are welcome to make their sites however they like, but Google in turn reserves the right to protect the quality and relevance of our index. To the best of our knowledge, all the major search engines have adopted similar positions. Q: Is Google trying to crack down on other forms of advertisements used to drive traffic? A: No, not at all. Our webmaster guidelines clearly state that you can use links as means to get targeted traffic. In fact, in the presentation I did in August 2007, I specifically called out several examples of non-Google advertising that are completely within our guidelines. We just want disclosure to search engines of paid links so that the paid links won't affect search engines. Q: I'm aware of a site that appears to be buying/selling links. How can I get that information to Google? A: Read our official blog post about how to report paid links from earlier in 2007. We've received thousands and thousands of reports in just a few months, but we welcome more reports. We appreciate the feedback, because it helps us take direct action as well as improve our existing algorithmic detection. We also use that data to train new algorithms for paid links that violate our quality guidelines. A: Sure. I wrote more answers about paid links earlier this year if you'd like to read them. And if you still have questions, you can join the discussion in our Webmaster Help Group.